unprecented proportions for that time in history. denied many of the poor in the Palatinate. froze solid and birds on the wing fell dead from exposure. the Palatinate was John William, Duke of Newburg, a Catholic. very popular with his fellow Palatinates. while some 1,900 came tothis area. which we know today as the area around Germantown. both camps while Reverend John Haeger ministered to the German Reformed. the German Lutherans and the German Reformed. took place on June 3, 1711.
and to Pennsylvania in search of land to farm. mounted as a wall plaque in the entry of St. Paul’s. 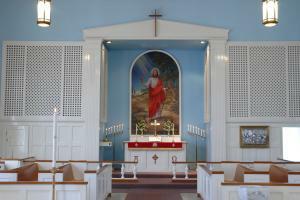 ‘Rise, O Children of Salvation’, still sung in Lutheran congregations. and was married to Kocherthal’s daughter, Benigna Sibylla. only twice a year as one of ten places of worship served by Berkenmeyer. minister and availing themselves of the services of a Reformed lay reader. marriages that existed among the Palatines. immigration of another group of Europeans seeking freedom and prosperity. part of the history of the congregation. Church will celebrate the 300th anniversary of the organization of our church. In the past, three men from this congregation have become Lutheran pastors. Benjamin is the fourth person from St. Paul’s to enter the Lutheran ministry. through our 300th anniversary as a congregation. with a special worship service at 10:30 A.M.
was followed by a dinner in our Fellowship Hall. the Festival of the Holy Trinity. He has served as our Interim Pastor for 21+ years. the Fellowship Hall after the worship. All are welcome. We wish Pastor Walley well in his retirement! for churches in our Hudson Conference. along with his wife, Margaret!